HAPPY HOLIDAYS EVERYONE!! I'VE BEEN ISLAND HOPPING FOR THE LAST MONTH OR SO FROM HAWAII TO THAILAND ENJOYING THE HOLIDAYS. IT'S NOTHING BUT FAMILY, WINE AND THE DINNER PARTIES AT OUR HOUSE IN KOH SAMUI AND I'M ENJOYING EVERY MINUTE OF IT, ALMOST TOO MUCH SEEING AS I FORGOT TO POST! SO JUST CHECKING IN BEFORE THE NEW YEAR, WHAT IS EVERYONE DOING TO BRING IN 2012?? P.S FOLLOW ME ON INSTAGRAM AT "4THANDBLEEKER" TO KEEP IN TOUCH! island hopping for the last month?? that sounds fabulous! I'll be following on instagram! 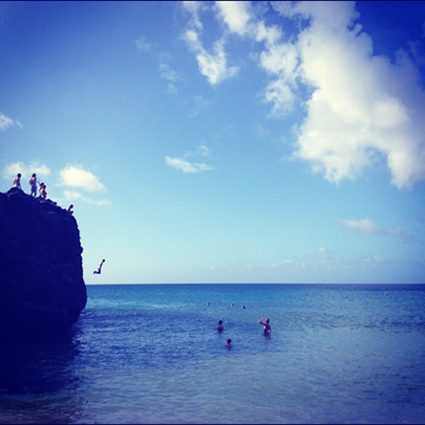 Everyone jumping into the sea looks fun! Happy Holidays and Happy New Years to you too!! Dreamy shots, look like a good way to end the year. Sounds like you are having an incredible time, I'm so jealous! Happy new year! Always nice to have a blogging break, it ain't the most important thing in life after all. and how amazing to spend christmas/ny in the sun..
oh how i long for those summery warm days and nights. You look so awesome, so modelly! wow so amazing! 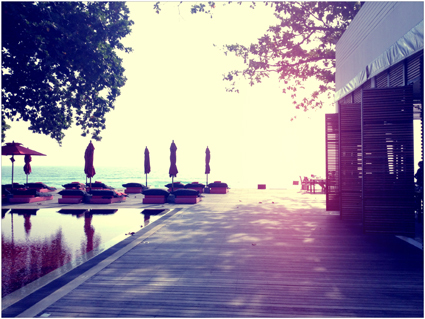 I was in March in Koh Samui and spend a wonderful time at the Library Hotel from your picture! take care girl, you are great. your gorgeous girl, keep on showing us your summer time! Sounds like you're having a wonderful Xmas and New Year. Love your pics. Happy New Year. Been there and love that jump! Great blog you have here but I was curious if you knew of any community forums that cover the same topics talked about in this article? I'd really like to be a part of online community where I can get feed-back from other experienced people that share the same interest. If you have any suggestions, please let me know. Thank you! It's the best time to make some plans for the future and it is time to be happy. I have read this post and if I could I wish to suggest you few interesting things or tips. Perhaps you could write next articles referring to this article. I wish to read more things about it! A lot of times it's tough to get that "perfect balance" between user friendliness and visual appeal. I must say you've done a fantastic job with this. I don't even know how I stopped up here, but I thought this put up was once good. I do not understand who you're however certainly you're going to a famous blogger in case you aren't already. & theme. Did you create this site yourself? Please reply back as I'm trying to create my own personal blog and would love to know where you got this from or what the theme is called. Cheers! complex and extremely broad for me. I'm looking forward for your next post, I will try to get the hang of it! Yes! Finally someone writes about coach baby diaper bags. I was pretty pleased to uncover this website. I want to to thank you for ones time for this wonderful read! It's amazing to visit this web site and reading the views of all colleagues concerning this post, while I am also keen of getting familiarity. You'd never guess the women at Paris Fashion Week have been traveling for nearly a month. With impeccable looks at every turn, they'll make red sole shoes christian louboutin you wonder just how they managed to cram so christian louboutin shoes much fashion into their suitcases and simultaneously make extraordinary christian louboutin shoes outfits feel so effortless. They're a group worth taking valentino shoes notes from, and that's exactly what we've been doing: christian louboutin Shoes curating only the best of the week to inspire red bottom shoes christian louboutin our style all year long. Take a look at christian louboutin sale the christian louboutin standout looks right here. No matter how red bottoms shoes on sale divine the clothes being shown at Paris Fashion Week are, we always find our eyes darting around to red bottom shoes for women quickly see what the bags being sent down the christian louboutin outlet runway look like.